On November 12, 2013, the United States Mint began accepting orders for the 28th release within the American Presidency $1 Coin Cover series. 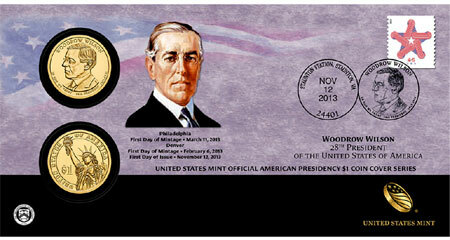 This releases honors President Woodrow Wilson who served in office between 1913 and 1921. Each coin cover includes two 2013 Woodrow Wilson presidential Dollars which are sourced from the first day of production at the Philadelphia and Denver Mint. This was March 11, 2013 at Philadelphia and February 6, 2013 at Denver. The coins are mounted on a display card and placed within an envelope illustrated with a portrait of the President against a colored background incorporating the American flag. A 46-cent Patriotic Star stamp is cancelled November 12 ,2013, Staunton, VA 24401. The covers are priced at $19.95 each. A production limit of 20,000 covers has been established. There are no household ordering limits imposed.